Apparently I’m still on the once-a-month schedule. I hope to get a bit better about that. When we lived in California, we were on a second floor apartment without a balcony. So, despite the near constant beautiful weather there, we couldn’t do any grilling. I’d be walking home and could only jealously smell the cooking meat where I had to go home into the stifling heat of an un-air-conditioned apartment. When we moved to Virginia, Angela and I each had a different requirement for our new home: she wanted a washer-and-dryer in-unit and I wanted some form of outdoor space. Luckily, we found a place where we both could be accommodated. As soon as the weather turned this spring, we took the coupon Lowe’s had helpfully sent us in the mail and purchased a Weber grill. Alison came over and we grilled both Saturday and Sunday. Since then, we’ve dodged the frequent thunder storms to mostly grill hamburgers and steak. I’ve only ventured into making Greek food a few times but Costco had a good deal on a Greek cookbook and I’ve always liked Greek restaurants. I figured chicken souvlaki would be a good starting point as it was familiar (eventhough I always get tempted by gyro’s when I eat at Greek restaurants). When I went to turn the chicken for the first time, I knew it would be good when I saw the gorgeous color it had turned. It tasted just as good. I suggested making lamb souvlaki sometime in the future and Angela asked why I wouldn’t just make the chicken souvlaki again. Which is indeed a good question. I almost wouldn’t recommend making this in a broiler. I doubt the broiler would do it justice. But it’s simple enough and good enough that I doubt it would turn out badly. If you’re willing to get the grill out on a weeknight (and honestly, how hard is it really? ), this makes an excellent easy meal. I made this and even had time to make some homemade Tzaziki and pita bread. Mix together 3 tbsp olive oil, the oregano, and salt and pepper. Pour over the chicken and toss well. Cover and refrigerate over night. 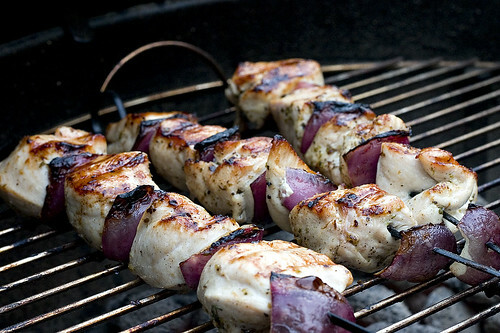 Thread the chicken pieces onto four skewers, alternating chicken with onion slices. Combine the remaining 2 tbsp olive oil with the lemon juice and mix well. Grill the chicken, covered, turning once, until cooked through, about 10 minutes per side, basting with the lemon juice-olive oil mixture frequently. Allow to rest for 5 minutes then serve with Tzatziki and pita bread.